Even the chefs were impressed. And they aren’t easily impressed. But don’t just take my word for it, or the word of many still-salivating fans. Try it out for yourself. I predict you’ll become a hungry-for-more fan too. ½ cup honey – I usually recommend raw honey, but in this case use liquid honey, an unfiltered one if you can find it (more nutrients!). ½ cup organic peanut butter – Either smooth or crunchy works. Make sure the only ingredient listed in your PB is peanuts! Double and triple check your popcorn for any unpopped kernels. Breaking a tooth on a kernel that’s covered in identically colored sweetness is not so sweet. Mix honey and syrup in a medium-size saucepan and heat over medium to medium-high heat. Once it begins to boil, remove from heat and add peanut butter, stirring until melted. Add vanilla, cardamom, and a pinch or two salt and stir. Divide popcorn into two large bowls for better coating. 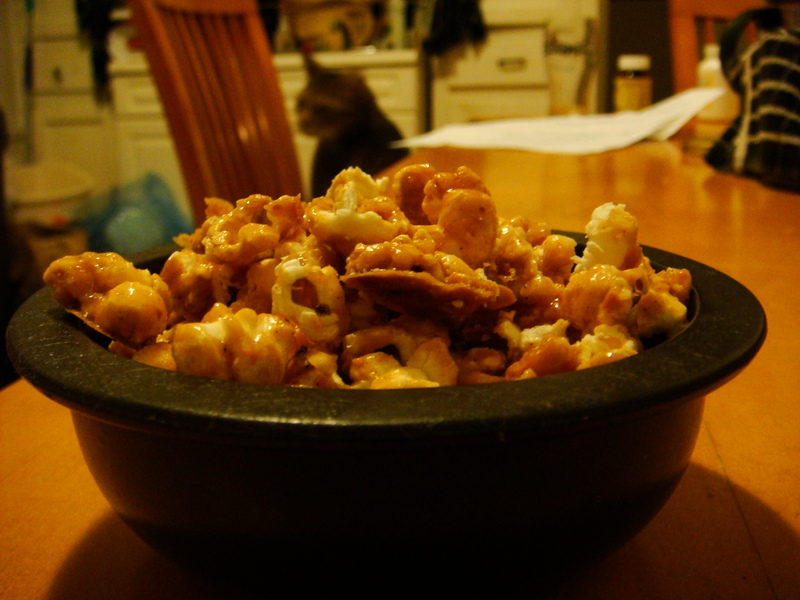 Drizzle PB mixture over popcorn and gently mix. I suggest doing this gradually so you can control the amount of coating. Sprinkle with more sea salt to taste. I highly recommend using the coarse kind here, it imparts pleasant bursts of salt that cut through the sweetness. To dry out the mixture, spread popcorn in single-ish layer on baking sheets. Bake at 300°F for 5-7 minutes. If you like a chewier treat, bake for 5 minutes. If you’d rather have a crunchier, drier version, bake for 7-10 minutes until popcorn’s beige color turns light brown. Remove from oven and allow to cool for a few minutes before using a spatula to transfer popcorn to bowl or container. Don’t wait too long though, the popcorn will weld itself to the baking sheet! Popcorn is kind-of my favorite food and this sounds amazing! Can’t wait to try it!